Time to Act On Mineral Theft, or We're Done For! 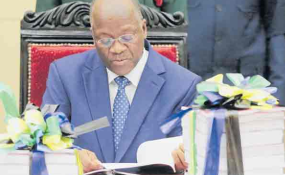 Dodoma — Minister of State, President's Office (Regional Administration and Local Government) George Simbachawene has stepped down after being named in a minerals report for signing dubious Tanzanite mining contracts when he served in the minerals portfolio. Announcing the resignation during a press conference, the Minister pointed out that he has decided resign to give room for government organs to conduct further investigations into the matter. "I've made the decision to comply with the President's order today that those involved in the matter should leave their posts vacant pending investigations," said the former Minister for energy and minerals.